The black/multiJazz 45 Camera Bag from Tamrac is designed to hold a compact DSLR with 3.5" lens, extra lens, flash, and accessories. Your camera and attached lens are held in shooting position with the lens facing down so that when you open the bag, just remove the set up and shoot. Interior touch fastened dividers allow you to configure the bag to suit your gear needs. The 600D polyester bag features zippered opening, and two side mesh storage pockets for memory cards, or batteries. Portability is via the removable, adjustable shoulder strap, or top grab handle. 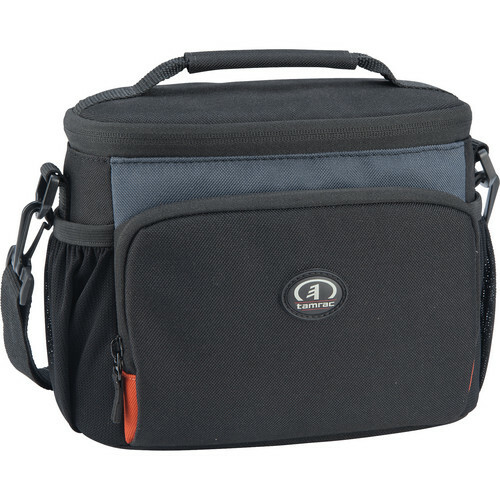 Box Dimensions (LxWxH) 10.3 x 7.9 x 5.1"
Jazz 45 Camera Bag (Black/Multi) is rated 3.0 out of 5 by 1. Rated 3 out of 5 by audioblind from Nice for the money It's pretty nice for the money. Great for a smallish kit. Holds what it pictures, but just barely! The padding is kind of thin and the Velcro dividers inside were really only designed to be moved a few times. It feels like the Velcro May be stronger than the bag! Not a bad bag for the enthusiast or family photographer, but not even close to pro level. I will keep it as a backup for a small grab and go, but will be replacing it with something made by ruggard most likely. is this bag fits for Olympus mirrorless camera with attached 12-50mm lens and 2 more lens? The specs on the bag in inches are 9.0 x 5.0 x 6.25 '' Your camera without the lens is in inches 4.8 x 3.5 x 1.7. So it will fit your camera with the 12-50mm with no problem. Depending on the sizes of your other lenses it will be a tight fit.